Just last month the fashion world learned of yet another social media casualty as J.Crew's Alejandro Rhett, the vice president of men's merchandising, posed for Instagram photos after staff layoffs. Hashtagged #hungergames and #maytheoddsbeeverinyourfavor, the insensitive photos were quickly deleted, but screenshots can still be seen on the Web. Just a week earlier, a fourth-grade teacher at Texas' Bennett Elementary school posted an article to her Facebook page in response to the now-famous, "pool party" incident in nearby McKinney, Texas. "This makes me ANGRY!" reads the post from Fitzgibbons, referring to police officer Eric Casebolt's resignation after being caught video throwing a black, bikini-clad teenage girl to the ground. "This officer should not have to resign. I'm going to just go ahead and say it...the blacks are the ones causing the problems and this 'racial tension,'" she continued. "I guess that's what happens when you flunk out of school and have no education." These types of social media missteps have Americans increasingly concerned about what they post online. 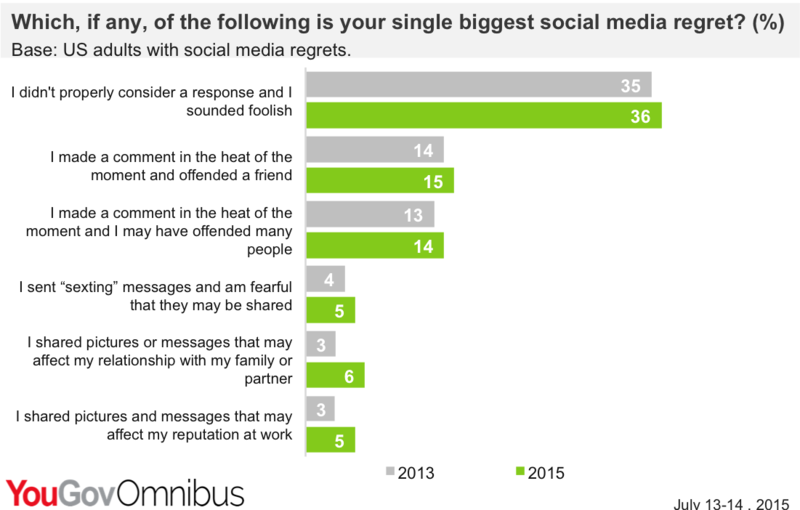 According to a new YouGov Omnibus survey, Americans who admit to making mistakes on social media are less worried today about sounding foolish than they were two years ago, but much more worried about damaging their reputation at work. Twenty-one percent surveyed are concerned they might adversely affect their careers with a questionable social media post. The same survey found 14 percent are afraid they may hurt relationships with family or partners by sharing misguided images or messages. As it turns out, 24 percent of women were much more likely to worry about possible damage to their close relationships than men, at 18 percent. Racially, while men appear are more worried about the effect of such blunders on their career, than women, at 20 percent versus 8 percent, respectively. Taken as a whole, 57 percent of Americans who use social media have posted or texted something that they regret afterwards. 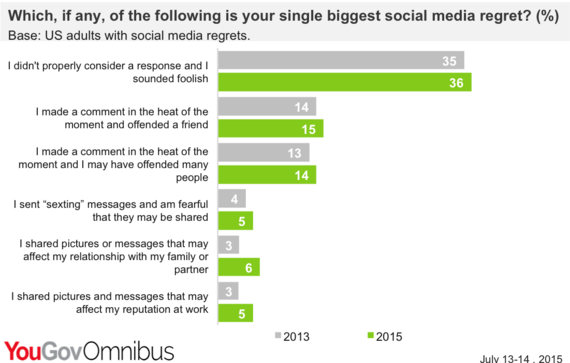 One in six regret a post at least once a week, and these numbers vary depending on age, with 20 percent of Millennials (18 to 34) being the worst regular offenders. When these mistakes occur, is an interesting aspect of the study. Social media blunders are happening at home, late at night when tired, or after drinking alcohol. And these habits vary widely depending on the age group, with statistical results below. In the end, the moral of the social media story is: stay conscientious, my friends. You never know what may come of an impromptu share.